The new Max Fan Pro Series - the second generation of Max-Fan - is a diagonal fan, using the 3D rotor-stator system, which has been improved to be more efficient and more silent. The design of the fan makes it very compact and easy to use, as the ventilation duct adapter is integrated into the mounting brackets. You just have to mount the adapter first and then fasten the fan with two screws. 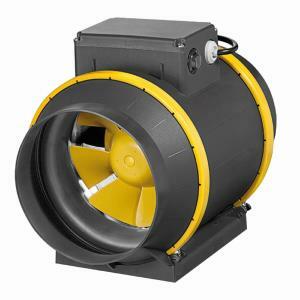 Due to the speed switch, the Max-Fan Pro Series is the most inexpensive version to regulate air performance manually.